Blue outline is Cape Charles channel, maintained at 18 feet by the Army Corps of Engineers. The Town requested the depth be extended to 35 feet to benefit existing and potential businesses. 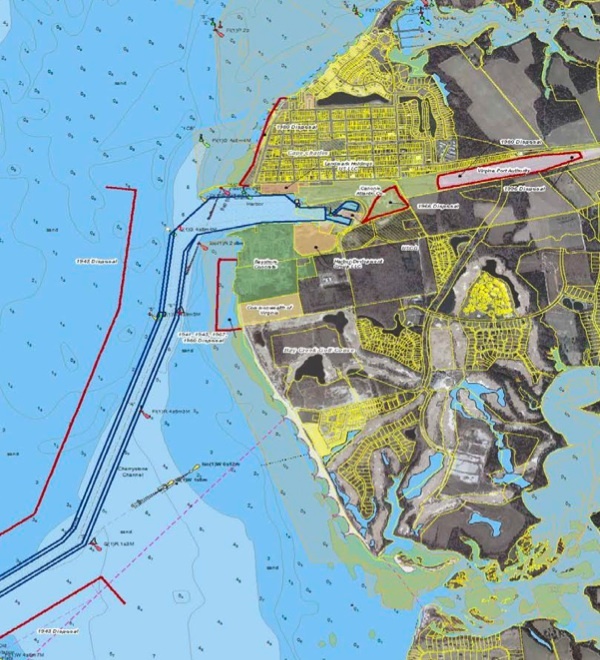 The Army Corps of Engineers has rejected a request by the Town of Cape Charles to deepen the Town’s outer harbor and channel. The request was made in April 2012 by Town Manager Heather Arcos, who wrote: “During the past year businesses in the Harbor have lost significant contracts due to the lack of sufficient depth for moving goods from the Harbor.” Arcos did not specify which businesses were losing contracts. In response, the Corps of Engineers performed a year-long feasibility study. On June 13, the Corps reported that only one business would benefit from deepening the channel: Bayshore Concrete. To qualify for full Corps funding, at least two users must be identified. If Bayshore is the only user, it would be required to bear half the expense, which, including interest and maintenance of the channel, could exceed $245,000 annually.